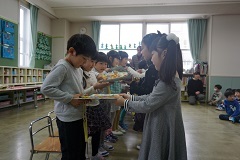 Today was the birthday party for children born in December. We had 12 friends celebrating in the 12th month! The children all seemed very happy to get their presents in front of their classmates. After that, Santa Claus came! His elves collected the Christmas present boxes that the IYK children decorated. He was sad until we showed him the cute new, decorated boxes. 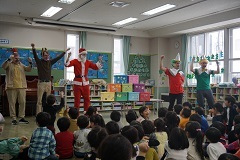 All the children received presents from Santa too. We hope all the children are looking forward to Christmas when it comes. December is such a fun month and today’s December birthday party was really nice!